The government are trying their best to dominate WikiLeaks founder Julian Assange, while blocking public search containing WikiLeaks, blocking banking donations, keeping him in under house arrest. 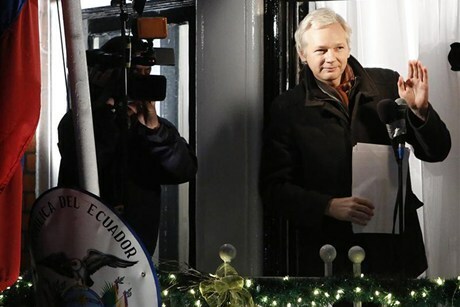 But its is a undeniable that the enthusiasm and the will power of Assange can never be ruled or dominated. Again the above fact came into light when Julian Assange announced in a defiant speech from the balcony of Ecuadorian embassy here as his supporters shouted, and sang Christmas carols. In his speech Assange said that WikiLeaks have planned to release over one million new secret documents that would affect "every country in the world"
It was his second ``balcony’’ address since he sought refuge there six months ago to avoid extradition to Sweden over allegations of sexual assault. And he made clear he had no intention of leaving the cramped mission which he described as ``my home, my office and my refuge’’ until ``this immoral investigation continues’’. Referring to the impasse over his extradition, Mr Assange said that as long as long as the American government sought to prosecute him and his native country, Australia, refused to defend his journalism, he would remain in the embassy. But, he said, he was open to negotiations. "However, the door is open, and the door has always been open, for anyone who wishes to use standard procedures to speak to me or guarantee my safe passage," he said. Mr Assange has been given asylum by Ecuador but is prevented by the British Government from leaving the country arguing that it is under a legal obligation to extradite him to Sweden. He will be arrested the minute he steps out of the embassy. Police say he broke his bail conditions when he sought refuge in the Ecuadorian embassy without informing them. Mr Assange claims the case against him is politically motivated and fears that Sweden would hand him over to Americans who have threatened to prosecute him for publishing confidential diplomatic cables. While talking about Jullian Assange and WikiLeaks, we would like to give you reminder that in this year we got several leaks from WikiLeaks, among them -'Detainee Policies' containing more than 100 classified or otherwise restricted files from the United States Department of Defense covering the rules and procedures for detainees in U.S. military custody. SpyFiles, GI Files (Global Intelligence Files & Five Million E-mails From Stratfor) & The Syria Files Containing 2.5 Million Emails of Syrian Politicians, Govt, Ministries & Companies.